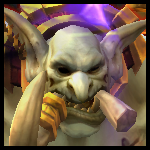 The Atal'dazar boss order is flexible but we'll be starting with Rezan so that we can get hero / lust on cooldown immediately. You can clear this pack now, or run to the right of them and kill them after Rezan. The latter can be smarter from a Bloodlust perspective. The Toxic Saurids will jump random targets and deal damage in a 5 yard AoE. Stay lightly spread and pump our AoE CC and DPS. They actually really hurt on higher keys. Don't be surprised if you have to defensive here. You won't need them for Rezan anyway so go ahead. Kill the oversized dinosaur and then make your way up the northwest staircase. Chop down the Saurids on your way back to the main path. So we're doing something a little weird here. We're going to pull half of the left-hand side for trash percentage and then head right to kill Vol'kaal. This way we avoid the horrifying Colossi while still getting the required number of enemy forces. Stay spread so the Juggernaut charge only hits one player. Soothe or kite it during Fanatic's Rage. Interrupt the Confessor's Bwonsamdi's Mantle and Mending Word casts or they'll put up big CC immunity bubbles and heal. The Honor Guards are useless. Key Interrupt: Fiery Enchant (Dazar'ai Augur, buffs nearby Juggernaut to throw fire). AVOID THE TWO COLOSSI PACKS. As advertised earlier, turn and run back toward Volkaal. There's a stealth mob on the stairs so let your tank lead. The Honor Guards are effectively immune to damage until you kill their Reanimation Totems. Once you do they'll start spewing heavy AoE damage. Use your healing cooldowns, use your defensives. SAVE YOUR POTION COOLDOWNS. If it's a high key or you had to pug your healer you might consider killing the totems last, after the rest of the mobs are dead (sans the Honor Guards). That was you don't have to deal with the horrific AoE at the same time as everything else. The double shieldbearer pack will pat up and down. Try and grab them separately unless you've equipped your balls of steel. The Shieldbearers channel big damage reduction shields that protect nearby enemies. You can knock them back or displace them. They also shield bash the nearest target so make sure the tank is nearby. This pack is disgusting. If you're an organised group then pop an invis potion here and run through to the boss. There's a mob in the first pack that can see through invis so you have to stick hard to the left. Follow the arrows and he won't pull. If you're in a more casual group then you'll have to clear both of these packs. Save your cooldowns for the second since the two Reanimated Honor Guards deal insane AoE damage. Don't worry about the pack you skipped while you kill the boss. It's impossible to pull it while the boss is engaged. Step away from them when you start, and when you finish but otherwise you are 100% safe. You can walk right up to the gate and say hi in person if you like. Sap / Imprison the two mobs on the right and walk through, hugging the wall. Have the tank pull them all to the left while everyone else runs through. The tank dies and after the pack resets the healer pops a mass res. .... Or just kill it. The guide assumes you won't need them for trash percentage but there'll be notes on other mobs you can skip if you do take them down. There are two more stealth mobs on the stairs. Let the tank lead and spam AoE's to prevent them opening with a stun. You should dispel the poison effect if possible. The pack at the bottom of the stairs is pretty tough and you'll need to interrupt or decurse the Unstable Hex cast from the Witch-Doctors to clear it efficiently. It's a very long CC. It'll spread to nearby allies when it ends so move out if you're hit. Avoid the dinosaurs in the middle. Just walk around the side of the platform. These mobs will be killed so rarely that by the end of the expansion we won't have any idea what they even do. Honestly though we just don't need them for percentage. More of the same here. Remember to stay spread 5 yards for the little Saurids. Interrupt what you can. Not particularly dangerous. The eyes in the mask will light up before it starts to spit fire. Try not to die to these. This is the 'really embarrassing death' of the expansion. It follows in the footsteps of the Black Rook Hold boulders. Really rough pack. Not a bad candidate for bloodlust on Fortified weeks. The Gilded Priestesses are reasonably useless but will heal themselves if you don't stand in the blood pools they put down. Don't stand in Sanguine thinking it's a blood pool. That's almost as bad as dying to the flaming masks on the stairs. Grab this pack if you still need trash. You'll need them if you invis potted the packs earlier but can skip them if you didn't. The path to the last boss is in the middle. Make sure you don't pull the Dino tamer on your way through. The Tainted Blood debuff lasts 15 seconds so you can pick it up long before the Transfusion cast. This is usually easier than having all five party members rush toward the same pool as the cast begins. You know the one, where four people get pools and one guy looks like an idiot as he turns around and hopelessly tries to get to the one that’s two and a half miles away. If all five party members do the mechanic correctly the boss will lose 25% of her health per transfusion cast. She has much higher HP than other dungeon bosses so if screw this up you’re in for a long fight. You need to either kill the Spirit of Gold adds or keep them CC’d. I’d recommend killing the first one or two and CC’ing the rest though ultra-coordinated groups will CC all of them for a quicker boss kill. Tank the boss on top of them for bonus cleave. Standing in the golden pools reduces your damage dealt by 30% for 10 seconds! I thought that might get your attention. 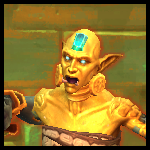 Healer: You need to dispel the Molten Gold debuff but it’s a long, low damage DoT so you can take your time. The natural evolution of the shaman class. Totems? Check. Voodoo? Check. Decaying Flesh? …Soon. Key Interrupt: Noxious Stench. Every two seconds he’s allowed to cast will apply another disease stack to the party. 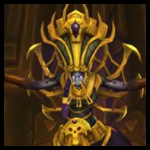 Let the tank take this one since the DPS will be focused on their totem. You’ll get one stack always. The three totems must die within 7 seconds of each other. The boss will auto-heal to full until this is done so don’t multi-DoT or worry about cleave. Save your padding for your random heroic later. Standard groups should assign one DPS to each totem. Watch all three and slow down if your totem is going down faster than the others. If you’re contributing DPS as a healer then try and do so somewhat evenly, or focus on whichever has the most health left. You technically want to be spread 8 yards in phase one to avoid sharing Toxic Leap but because you’re all on separate totems this is rarely a problem. Just don’t stand on top of each other. Tank: During phase two (after the totems have died) kite the boss on a circular path around the edge of the arena. He’ll drop pools behind him and the melee will need somewhere to stand. This is either an easy or horribly difficult fight to heal depending on how well your party interrupts the Noxious Stench cast. If interrupts are going well: Add some damage to any totems lagging behind. If interrupts are going poorly: Noxious Stench hits every 20-25 seconds. Start prepping for the damage before the cast goes out because three stacks of the disease is rough. Expect to have to move a lot in phase 2. You’ll need to save your healing cooldowns for here. The loa of kings! A giant dinosaur! Annnnnd the easiest boss in the dungeon. Tank and fight the boss next to one of the pillars that surround the room. Use them to line of sight the Terrifying Visage cast. By fighting the boss against a pillar you don’t have to worry about the bone piles at all – reducing the encounter to two easy mechanics. Targeted by Pursuit? Run toward the far end of the room, attempting to stay within the confines of the river. This stops the boss himself from disturbing any bone piles. Get caught? Apologise to your healer, pop a defensive and then keep hitting the boss. Devour doesn’t interrupt casts. You can also pop Iceblock / Turtle here. 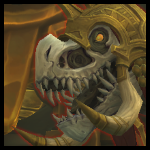 Healer / Tank: The tank will get savaged during the Serrated Teeth debuff. Save your big defensive cooldowns and externals for this. There isn’t otherwise much damage in the fight. Sneaky Shadowmeld: You can shadowmeld the Pursuit cast once he starts chasing you. It’ll cancel it entirely. Scared of spiders? You. Will. Be. Key Interrupt: Wracking Pain. It’s a heavy DoT on one player that can also be decursed if available. Tank the boss on one side of the room and put a marker on the other. When Soulrend goes out (arrows above your head) run toward the marker and stack tightly as a group of four. The tank won’t get it. When the adds spawn, use AoE burst damage and CC to kill them quickly. You’ll take moderate ticking damage until they’re dead. They must die before they reach the boss or you’ll take a very heavy AoE DoT and die until you’re dead. Yes. It’s that bad. Dodge the spiders. Stop DPS’ing if you have to, you’ll die very very quickly if you get hit by any. You can use immunities to “soak” the spiders and force them to explode. This clears the area very effectively. Healer: There’s moderate tank damage but little otherwise so make sure you’re DPS’ing.